This is a salad that comes together in minutes if you’ve got gomashio in the cupboard. If you don’t it’s no big deal: you’ll have plenty after making this recipe! 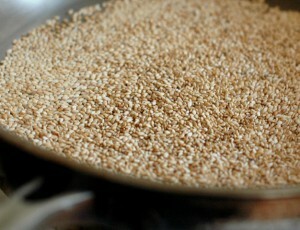 Gomashio is a sesame salt common in Japanese and Korean cuisines, and an important part of the macrobiotic diet too (as it helps reduce sodium intake). Suitable for seasoning a variety of dishes- from plain rice rice or noodles to omelettes and salads- it transforms a simple bowl of grated carrots into a taste sensation here. Making your own is just logical as you can control the amount of salt added and ensure you’re getting the freshest and best gomashio it’s possible to get! Unhulled sesame seeds are a particularly good source calcium and also contain notable amounts of iron, magnesium, zinc, Vitamin E and omega-3 fatty acids and, because it’s crushed, gomashio has the added benefit of making these nutrients readily digestible. Nori is another fantastic source of calcium and is also rich in iron and potassium. It has a cleansing, detoxifying effect on the body when eaten in moderation. 1. 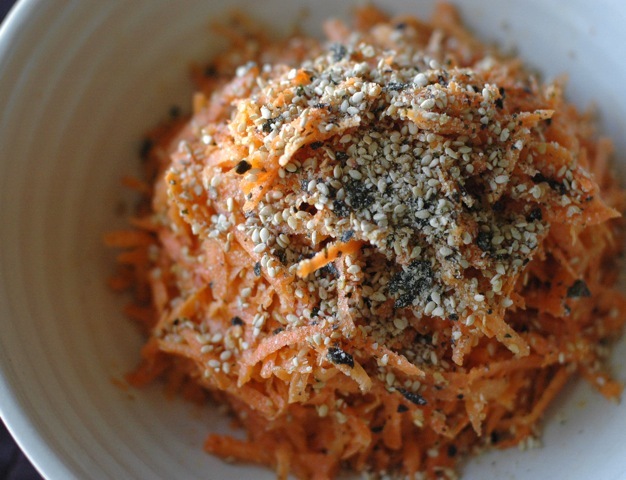 Combine carrots with vinegar and sesame oil in a wide bowl. 2. To make gomashio heat a wide saucepan over medium heat. When hot add the sesame seeds and salt and cook, stirring constantly, until the sesame seeds begin to pop and smell toasty: this should take about 3 to 4 minutes. 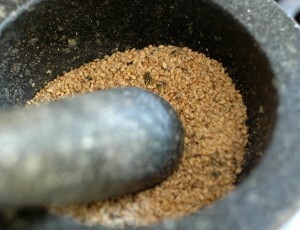 Remove from heat and keep stirring occasionally to make sure the seeds don’t burn. Meanwhile, using tongs, toast 1 side of the nori over the open stove until it turns bright green and shrivels a little. Crumble over the sesame seeds immediately then transfer everything to a mortar and pestle or spice grinder and grind most of the seeds, stopping while some are still whole. 3. Add 3 – 4 tablespoons of gomashio to the carrots and combine (store the rest in an air-tight jar for later). Transfer to a serving dish and sprinkle with another tablespoon of gomashio.